The Outer Banks of North Carolina has so much more to offer than just a pretty picture. There is more to these barrier islands than meets the eye. From Corolla to Ocracoke visitors of the OBX can find something knowledgeable and appealing. Historical landmarks are scattered all along the Outer Banks varying from brick lighthouses to giant sand dunes. Be sure to check out each of these sites during your vacation to the OBX this year. The Currituck Beach Lighthouse was the last major brick lighthouse built on the Outer Banks. It stands 158 feet tall and is made of red-brick. The lighthouse towers above the northern Outer Banks landscape in the historic Corolla Village. Visitors can climb the winding staircase of 220 steps to the top for a panoramic view of Currituck Sound, the Atlantic Ocean and the Currituck Outer Banks. The Currituck Beach Light Station still serves as an aid to navigation. The beacon comes on automatically every evening at dusk and ceases at dawn. This memorial marks the site of the world’s first powered flight on December 17th, 1903. The visitor’s center features full-scale reproductions of the Wright 1903 Powered Flyer and interpretive presentations. The grounds feature historical markers of each attempted powered flight, a replica camp buildings and a 60-foot granite monument on top of a 90-foot dune honoring the Wright Brothers. The largest natural living sand dune on the East Coast. The park is 426-acre park is a leading location for kite flying, hiking, and sightseeing and sunsets, with a view arching from the ocean to Roanoke Sound. It also includes a visitor center with a museum and a 360-foot boardwalk with exhibits that explain the dune’s ecology. The Graveyard of the Atlantic is a region of the ocean just offshore of the Outer Banks where some 3,000 shipwrecks decorate the depths from Kitty Hawk south to Ocracoke. Shipwrecks have happened all along this region of North Carolinas coast due to its deceptive shoals, underwater sandbars and the powerful storms that have come along. Today you can see some of these wrecks from shore or by snorkeling or scuba diving. The Graveyard of the Atlantic Museum is a public, non-profit, educational institution. The museum is dedicated to the preservation and presentation of the shipwrecks of the North Carolina Outer Banks from the earliest periods of exploration. The Roanoke Marshes Lighthouse is tucked away at the quiet east end of the Manteo Waterfront. This is one of the most overlooked of the Outer Banks lighthouses because of its small stature and limited visibility. Visitors to historic Downtown Manteo will have no problem spotting the small lighthouse which stretches out 40 yards into the Roanoke Sound. This lighthouse has a white exterior with black shutters and red shingled roof with a wooden boardwalk with a waterfront view. 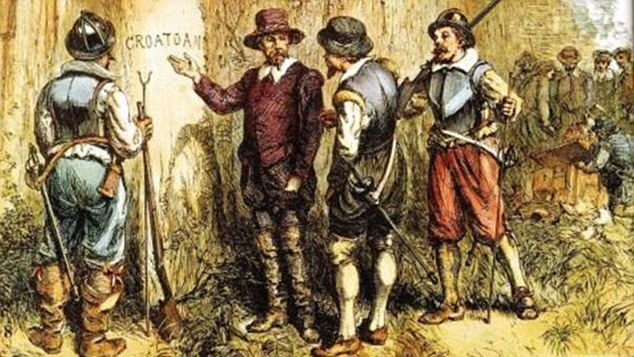 The village of Roanoke was one of the first English colonies to be established on the soil. The colony was recruited by Sir Walter Raleigh. The Governor, John White, traveled back to England to later return with supplies the colonist requested. Three long years later John White returned to find the area that was once a village was stripped of its people. What was left behind were some small cannons, an opened chest, a tall fence built around the perimeter of the former village site, and a single word carved on a fence post, “Croatoan” and the letters “CRO” carved into a nearby tree. Their fate then subjected to many theories and controversies. Their story is reenacted every summer during performances of The Lost Colony, the nation’s longest symphonic drama in Fort Raleigh’s Waterside Theatre in Manteo. The Elizabethan Gardens is a 10.5 acre public garden located within Fort Raleigh National Historic Site. The Gardens contain over 500 different species of plants. Flower displays are changed seasonally to insure colorful displays throughout the year. Elaborate gardens were kept to entertain Queen Elizabeth I during her region. The Elizabethan Gardens was created for visitor’s enjoyment, and as a living memorial to the time when Sir Walter Raleigh’s lost colonists lived in this very place over 400 years ago. The Fort Raleigh National Historic Site sits on 513 acres on the north end of Roanoke Island just three miles from the historic town of Manteo. It was established in 1941. The park honors the first English attempts to colonize the New World from 1585 to 1587. Today the park is home to a visitor’s center, museum, Elizabethan Gardens, The Lost Colony outdoor drama, historic tour trail, gift shop, and picnic area. Fort Raleigh National Historic Site preserves the cultural heritage of the Native Americans, European Americans and Africa Americans who have lived on Roanoke Island. Visitor’s traveling towards Hatteras Island can’t help but notice the black and white horizontal striped structure peaking over the trees on the soundside. The lighthouse is 156 feet and has 214 steps to the top. The Currituck Beach Lighthouse is considered its architectural twin. The Bodie Island Light Station is located at the northern end of Cape Hatteras National Seashore. The Cape Hatteras Lighthouse is the tallest in the United States standing at 208 feet. This lighthouse is painted in black and white spirals with a red base. It is one of the most famous and most recognizable lighthouses in the world. Cape Hatteras Lighthouse protects one of the most treacherous stretches of the Outer Banks, with a beam of light that spans 20 miles out to sea. Considered one of Hatteras Island’s biggest attractions. Come and climb the 257 steps to find the most rewarding panoramic view of Hatteras Island from Avon to Hatteras Village. The Ocracoke Lighthouse is North Carolinas oldest operating lighthouse. And the second oldest in the United States. The lighthouse only stands at 65 feet tall and is the smallest lighthouse on the Outer Banks. The lighthouse still towers over the 4 square miles of Ocracoke Village. Its light can be spotted up to 14 miles into the Pamlico Sound and the Atlantic Ocean.